Best Buy has posted placeholder SKUs for 3 "Coming Soon" models of Apple's Wi-Fi iPad at prices of $599 and $699, possibly suggesting that retail channels are prepping for the release of the second-generation iPad expected this spring. 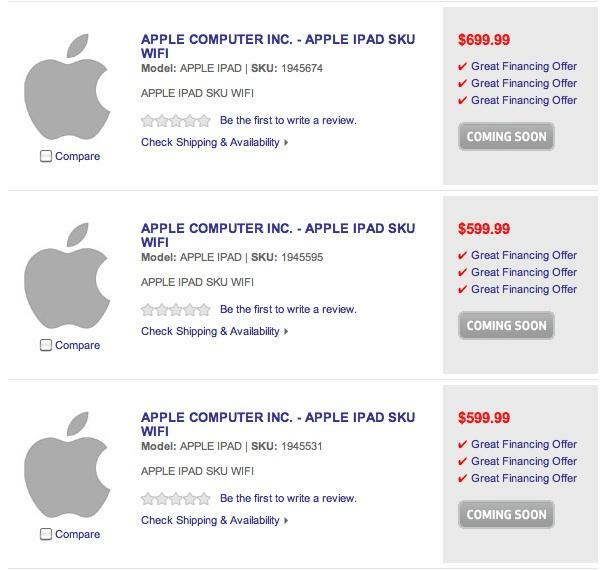 The listings on Best Buy's online store describe an "Apple Computer Inc. - Apple iPad SKU WiFi." Two of the SKUs have a $599.99 price tag, while one of the SKUs is priced at $699.99. All six of the current-generation iPad models are still available from Best Buy's website. By way of comparison, the $699.99 64GB Wi-Fi first-generation iPad has a SKU of 9811424, while the similarly priced "Coming Soon" iPad has a SKU of 1945674. Though the mystery iPad SKUs could hint at a next-generation tablet device from Apple, it should be noted that they could also be the result of an inventory error. Recent reports suggest that the iPad 2 could have quadruple the resolution of the original iPad. The next-generation tablet will also reportedly have front and rear cameras and possibly an SD card slot. Last March, AppleInsider reported that dummy SKUs for Apple products, possibly the iPad or new MacBook Pros, were showing up in Best Buy's inventory system. Apple partnered with the retail giant last year, allowing 'most' Best Buy brick-and-mortar locations to offer the iPad at launch, though initial supply was limited. All Best Buy locations began carrying the iPad on Sept. 26. Best Buy CEO Brian Dunn made waves last fall when he made comments suggesting that sales of some notebook models at Best Buy's stores were being cannibalized by as much as half. Dunn quickly retracted the comment, quipping that reports of the demise of netbooks "are grossly exaggerated." According to Dunn's clarified statements, tablets like the iPad represents "an incremental opportunity" for Best Buy, while computers would "remain a very popular gift" for the 2010 holiday season.